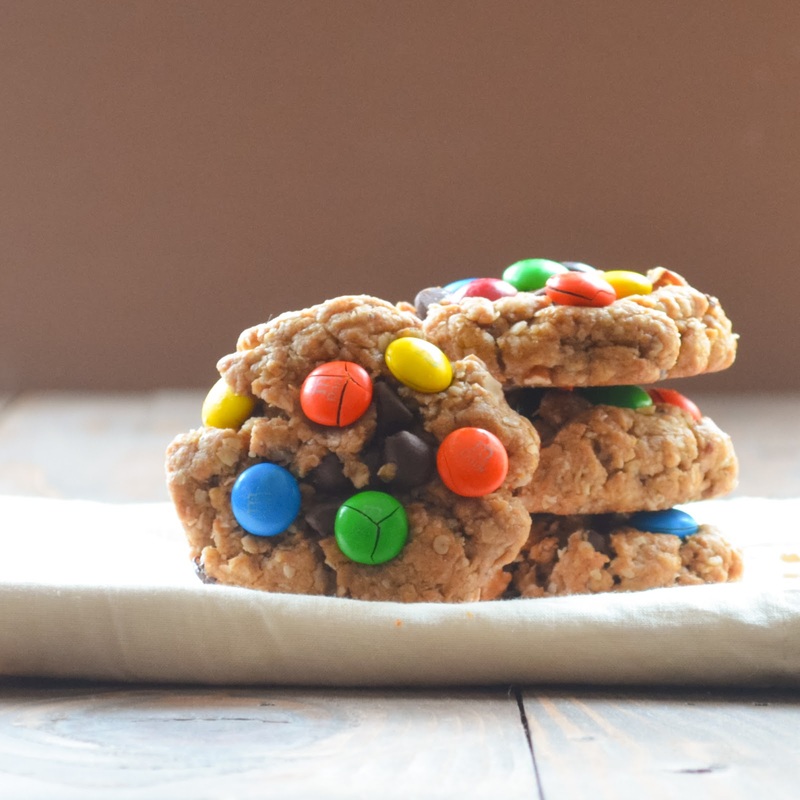 Sometimes life calls for Monster Cookies loaded with oats, peanut butter, chocolate chips and M&M's. I can't think of a better lunch box treat! I usually don't eat M&M's for a million reasons but sometimes a cookie with some crunchy little hard shell covered candies are an exception. Especially the dark chocolate M&M's... They might be a new found weakness.. Since I've been so busy with appointments lately I knew these would make a special treat to add to the kids lunch box, a little hidden surprise to remind the kids and hubby just how much I love them. Plus who doesn't like a surprise plate of cookies when you walk through the door? These monster cookies are super easy to make and always a winner. FYI:These are technically gluten-free but please double check all your ingredients if you are gluten sensitive! I couldn't find anything on the Dark Chocolate M&M's about having gluten, but please double check the ingredients you use if you have a gluten-free household. Add peanut butter and butter. Add brown sugar and beat until creamy. Add eggs, vanilla and baking soda. Beat 2 minutes or until light and fluffy. Scrape sides of bowl and add quick oats.. Mix on low speed until blended. Add chocolate chips and nuts if using.. I used pecans because its what I had in the cupboard but if you have peanuts they are amazing! Just saying..
Oh and we can't forget the M&M's.. Dark chocolate hard candy covered goodness! Take a double standard size cookie scoop of dough or about 2 1/2 tablespoons of dough and roll into a ball. Use your hand to flatten dough into a little patty. These don't spread much. Press M&M pieces into cookies. Bake in a 350 degree oven for 10-12 minutes or until lightly brown around the edges. Allow cookies to cool on cookie sheet for 5 minutes before removing to a cooling rack to finish cooling. Monster Cookie filled with peanut butter, oatmeal, chocolate chips and M&M's. 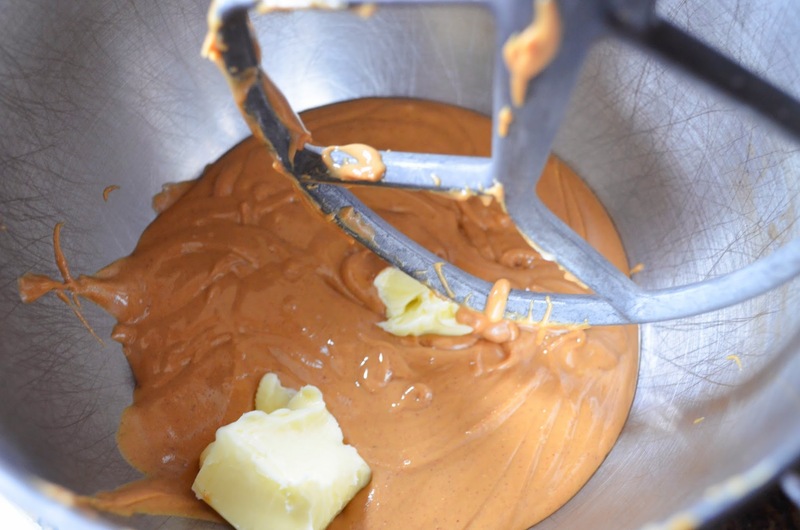 Beat peanut butter, butter and brown sugar together until light and fluffy. About 2 minutes. Add eggs, vanilla and baking soda. Beat until well blended. Scrape sides of bowl. 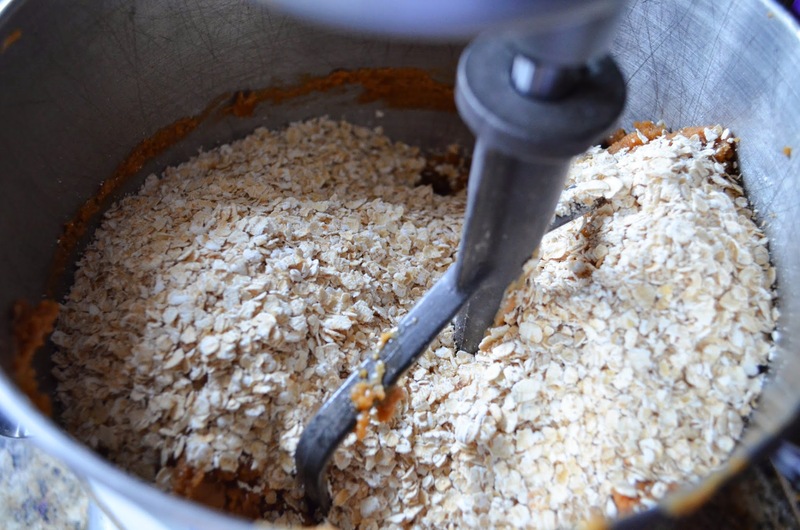 Add quick oats and mix until blended. Add chocolate chips, nuts (if using), and 1/2 cup M&M's. Blend until well combined. 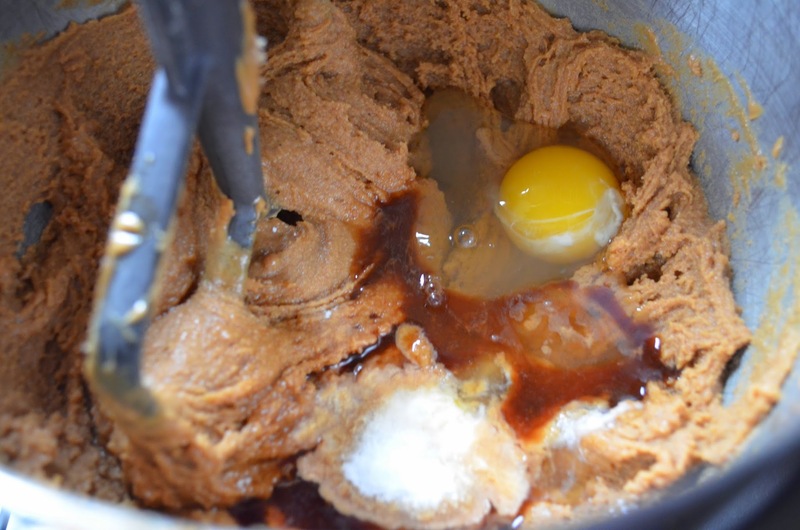 Using a standard size cookie scoop take 2 scoops of dough and roll into a ball or about 2 1/2 tablespoons of dough. Place ball on an ungreased cookie sheet and press until top of ball is flattened. Cookies don't spread much. Press remaining 1 cup of M&M's into the top of cookies. Bake in preheated oven for 10-12 minutes or until lightly brown around edges. Allow cookies to cool for 5 minutes on cookie sheet and remove to a cooling rack. Ha..Ha.. I guess I feel better about eating 2 or 3 cookies filled with oatmeal and a few sweet treats then a whole bag of M&M's by themselves..
Monster cookies are my favorite! 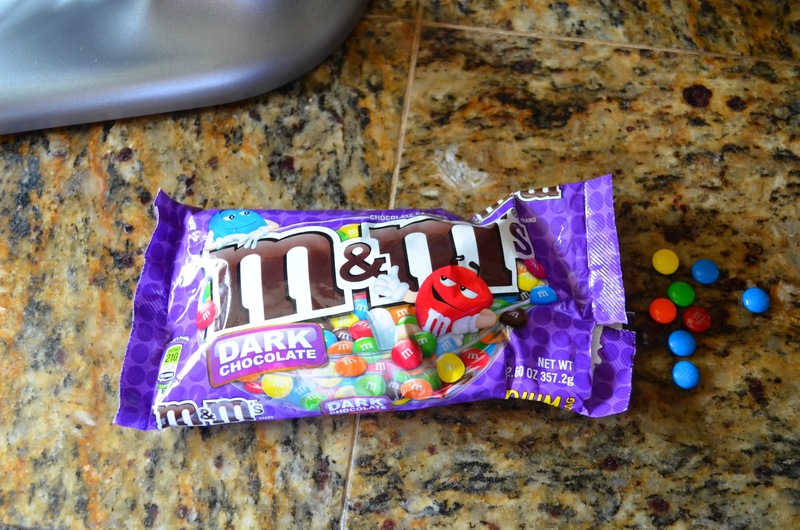 And with dark chocolate M&M's?! Yes, please!